In 1984, Wes Craven revitalized the tired and repetitive slasher sub-genre with the release of A Nightmare on Elm Street. 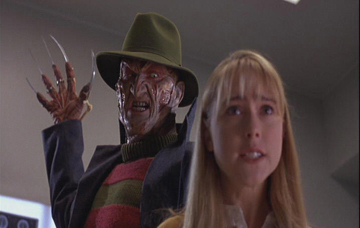 By setting his villain loose in the arena where we are at our most vulnerable, Craven not only created a horror masterpiece but added a new icon to the horror pantheon in Freddy Krueger. Although the resulting franchise lasted for five more films before cross-breeding with the Friday the 13th series, Craven pretty much abandoned the series after the original, with executive producing the third film his only additional contribution. But in 1994, Craven decided it was time to revisit Freddy Krueger once more, putting a new spin on the mythos in the process. New Nightmare's conceit again takes on one of humankind's latent fears: that the nightmares which haunt our sleep might somehow come creeping into our waking life, thus making them virtually unstoppable.